The Spanish Colonial Revival Style (Spanish: Arquitectura neocolonial española) is an architectural stylistic movement arising in the early 20th century based on the Spanish Colonial architecture of the Spanish colonization of the Americas. The antecedents of the Spanish Colonial Revival Style can be traced to the Mediterranean Revival architectural style. For St. Augustine, Florida, three northeastern architects, New Yorkers John Carrère and Thomas Hastings of Carrère and Hastings and Bostonian Franklin W. Smith, designed grand, elaborately detailed hotels in the Mediterranean Revival and Spanish Revival styles in the 1880s. With the advent of the Ponce de Leon Hotel (Carrère and Hastings, 1882), the Alcazar Hotel (Carrère and Hastings, 1887) and the Casa Monica Hotel (later Hotel Cordova) (Franklin W. Smith, 1888) thousands of winter visitors to 'the Sunshine State' began to experience the charm and romance of Spanish influenced architecture. These three hotels were influenced not only by the centuries-old buildings remaining from the Spanish rule in St. Augustine but also by The Old City House, constructed in 1873 and still standing, an excellent example of early Spanish Colonial Revival architecture. The possibilities of the Spanish Colonial Revival Style were brought to the attention of architects attending late 19th and early 20th centuries international expositions. For example, California's Mission Revival style Pavilion in white stucco at the World's Columbian Exposition of 1893 in Chicago, and the Mission Inn, along with the Electric Tower of the Pan-American Exposition in Buffalo in 1900 introduced the potential of Spanish Colonial Revival. They also integrated porticoes, pediments and colonnades influenced by Beaux Arts classicism as well. By the early years of the 1910s, architects in Florida had begun to work in a Spanish Colonial Revival style. Frederick H. Trimble's Farmer's Bank in Vero Beach, completed in 1914, is a fully mature early example of the style. The city of St. Cloud, Florida, espoused the style both for homes and commercial structures and has a fine collection of subtle stucco buildings reminiscent of colonial Mexico. Many of these were designed by architectural partners Ida Annah Ryan and Isabel Roberts. The major location of design and construction in the Spanish Colonial Revival style was California, especially in the coastal cities. 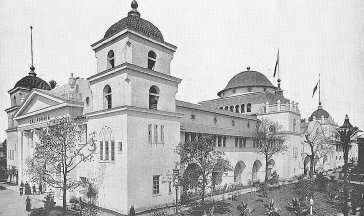 In 1915 the San Diego Panama-California Exposition, with architects Bertram Goodhue and Carleton Winslow Sr., popularized the style in the state and nation. It is best exemplified in the California Quadrangle, built as the grand entrance to that Exposition. In the early 1920s, architect Lilian Jeannette Rice designed the style in the development of the town of Rancho Santa Fe in San Diego County. The city of Santa Barbara adopted the style to give it a unified Spanish character after widespread destruction in the 1925 Santa Barbara earthquake. The County Courthouse, designed by William Mooser III, is a prime example. Real estate developer Ole Hanson favored the Spanish Colonial Revival style in his founding and development of San Clemente, California in 1928. The Pasadena City Hall by John Bakewell, Jr. and Arthur Brown, Jr. , the Sonoma City Hall, and the Beverly Hills City Hall by Harry G. Koerner and William J. Gage are other notable civic examples in California. Between 1922 and 1931, architect Robert H. Spurgeon constructed 32 Spanish colonial revival houses in Riverside and many of them have been preserved. The neocolonial companion building (1940s) to the colonial Mexico City palace of the ayuntamiento (1720s). INBA-catalogued house built in the colonial californiano style in Lomas de Chapultepec, Mexico City. The Spanish Colonial Revival of Mexico has a distinct origin from the style developed in the United States. Following the Mexican Revolution, there was a wave of nationalism that emphasized national culture, including in architecture. The neocolonial style arose as a response to European eclecticism (favored during the Porfiriato). The 1915 book La patria y la arquitectura nacional by Federico Mariscal was influential in advocating viceregal architecture as integral to national identity. During the government of President Venustiano Carranza (serving 1917 to 1920), tax exemptions were offered to those that built houses in a colonial style. In the early 1920s there was a surge of houses built with Plateresque elements; such as grotesques, pinnacles and mixtilinear arches. Secretary of Education José Vasconcelos (who shaped the cultural philosophy of the post-Revolution government) was an active promoter of neocolonial architecture. Traditional materials such as tezontle, cantera and Talavera tiles were incorporated into neocolonial buildings. The colonial-era National Palace was significantly altered between 1926 and 1929: the addition of a third floor and changes to the facade. The modifications were done in a manner corresponding to the original style. Similarly, the colonial Mexico City government building was remodeled in the 1920s and a neocolonial companion building was built in the 1940s. The style, as developed in the United States, came full circle to its geographic point of inspiration as in the late 1930s, single-family houses were built in Mexico City's then-new upscale neighborhoods in what is known in Mexico as colonial californiano (Californian Colonial). That is, a Mexican reinterpretation of the California interpretation of Spanish Colonial Revival. Many houses of this style can still be seen in the Colonia Nápoles, Condesa, Polanco and Lomas de Chapultepec areas of Mexico City. Gota de Leche Building in Manila. After colonial rule by Spain for over 300 years, and for the most part being administered under the province of New Spain (Mexico), the Philippines received Iberian and Latin-American influences in its architecture. By the time the United States conquered the Philippines, the Mission-style and Spanish Colonial Revival architecture also arrived, with inspirations from California. American architects further developed this style in the Philippines, given the Philippines' Spanish heritage, but at the same time modernizing the buildings with American amenities. The best example of the Spanish Colonial Revival architecture and California mission style is the famed Manila Hotel designed by William E. Parsons and built in 1909. Other examples exist throughout the country such as Gota de Leche, Paco Market, and thousands more, especially in the churches and cathedrals throughout the country. Influential Australian architects such as Emil Sodersten and Professor Leslie Wilkinson brought back styles from Italy and Spain in the early 20th century, convinced that Mediterranean styles would be well-suited for the Australian climate and lifestyle. Mediterranean style became popular in places like Sydney suburbs Manly and Bondi in the 1920s and 1930s. One variant, known as Spanish Mission or Hollywood Spanish, became popular as Australians saw films of and read in magazines about the glamorous mansions in that style that Hollywood movie stars had. Spanish mission houses began to appear in the wealthier suburbs, the most famous being Boomerang, at Elizabeth Bay. The Plaza Theatre in Sydney is a celebrated cinema in the style. In the 1930s, numerous houses in Spanish Revival style were built in Shanghai, particularly in the former French Concession. Although Shanghai was not culturally linked to the Spanish-speaking world, these buildings were probably inspired by Hollywood movies, which were highly influential in the city at the time. Local architectural magazines of the period like The Chinese Architect and The Builder regularly printed detailed examples of the style for local builders to copy and implement. Spanish Colonial Revival architecture is characterized by a combination of detail from several eras of Spanish Baroque, Spanish Colonial, Moorish Revival and Mexican Churrigueresque architecture, the style is marked by the prodigious use of smooth plaster (stucco) wall and chimney finishes, low-pitched clay tile, shed, or flat roofs, and terracotta or cast concrete ornaments. Other characteristics typically include small porches or balconies, Roman or semi-circular arcades and fenestration, wood casement or tall, double–hung windows, canvas awnings, and decorative iron trim. One of the most accomplished architects of the style was George Washington Smith who practiced during the 1920s in Santa Barbara, California. His own residences El Hogar (1916, a.k.a. Casa Dracaena) and Casa del Greco (1920) brought him commissions from local society in Montecito and Santa Barbara. An example landmark house he designed is the Steedman estate Casa del Herrero in Montecito, now a registered National Historic Landmark and restored historic house—landscape museum. Other examples are the Jackling House and Lobero Theatre also in California. California Quadrangle and El Prado, Balboa Park, San Diego, California: by Bertram Goodhue, for the Panama–California Exposition (1915-15). Casa del Herrero, Montecito, California, architects George Washington Smith and Lutah Maria Riggs, 1926. The Main Quad and many buildings in the campus of Stanford University, designed by Frederick Law Olmsted, 1886–1891. "Casa Dracaena" (a.k.a. El Hogar or Heberton House), George Washington Smith residence #1, 1916. Santa Barbara County Courthouse, by William Mooser III, in Santa Barbara, California, completed 1929. George Fearn House in Mobile, Alabama, completed 1904. Farmer's Bank in Vero Beach, Florida, completed in 1914. Adamson House, "Taj Mahal of Tile" by Stiles O. Clements, in Malibu, California, completed 1930. Naval Training Center, San Diego, California, completed 1923 (Buildings 1–26, and Officer's Quarters "A"-"D"). Other phases completed 1936 (Barracks 27–30, Camp Lawrence), and 1942 (Camp Luce). Quapaw Baths building in Bathhouse Row, Hot Springs, Arkansas, completed in 1922. "Casa de las Campañas" in Hancock Park district, Los Angeles, California, completed in 1928. C.E. Toberman Estate, by Russell & Alspagh, in Hollywood, California, completed 1924. Frank H. Upham House in Altadena, California, completed 1928. Azalea Court Apartments in Mobile, Alabama, completed in 1928. "La Casa Nueva", Workman and Temple Family Estate, in City of Industry, California, completed 1927. Castillo Serrallés in Ponce, Puerto Rico, completed in the 1930s. William S. Hart "La Loma de los Vientos" Ranch, arch. Arthur R. Kelly, Newhall, California, completed in the early 1920s. Gaylord Suites in San Francisco, California, completed in 1928. Randolph Air Force Base (various structures) near San Antonio, Texas, designed in 1929. Hollywood, Homewood, Alabama, a 1926 residential development in Homewood, Alabama. El Capitan Theatre, Hollywood, built in 1928. "Death Valley Ranch", "Scotty's Castle," a landmark in Death Valley National Park, which was begun in 1922 and had construction on the original design continue sporadically as late as 1943. Scripps College, by Gordon Kaufmann and Sumner Hunt, in Claremont, California, women's college and campus established in 1926 by Ellen Browning Scripps. Hamilton Air Force Base, in San Francisco Bay Area near Novato, California, completed in 1934. Pima County Courthouse in Tucson, Arizona, designed by Roy Place. Louis P. and Clara K. Best Residence and Auto House, Clausen & Clausen, Davenport, Iowa, constructed in 1909. Pasadena City Hall, by Bakewell and Brown, in Pasadena, California, completed 1927. Hortonville Community Hall, by Robert Messmer, in Hortonville, Wisconsin, built in 1912. Thomas Jefferson Hotel in Birmingham, Alabama, opened in 1929. Belvedere Apartments in Columbia, Missouri, completed in 1927. Adler Hotel in Sharon Springs, New York, built in 1928. El Reno Municipal Swimming Pool Bath House in El Reno, Oklahoma, completed in 1935. The style also spread to Australia, where it was known as Inter-War Spanish Mission. The above example is in Bondi, Sydney. ^ Bailey, Gauvin Alexander. Art of Colonial Latin America (London: Phaidon Press 2005): 402-05. ^ "File: mw137h3.jpg, (364 × 216 px)". erbzine.com. Retrieved 2015-09-06. ^ "File: 79983-004-5084E319.jpg, (391 × 450 px)". media-2.web.britannica.com. 2004-11-22. Retrieved 2015-09-04. ^ Sluis, Ageeth (2016). Deco Body, Deco City: Female Spectacle and Modernity in Mexico City, 1900–1939. U of Nebraska Press. p. 194. ISBN 9780803293922. Retrieved 24 May 2017. ^ a b c Moreno, Gilberto Romero (2005). Tendencias actuales de la arquitectura mexicana (in Spanish). USON. pp. 21–25. ISBN 9789706892508. Retrieved 24 May 2017. ^ Burian, Edward R. (1997). Modernity and the Architecture of Mexico. University of Texas Press. p. 66. ISBN 9780292708532. Retrieved 24 May 2017. ^ Patrice Elizabeth Olsenand. Artifacts of Revolution: Architecture, Society, and Politics in Mexico City. p. 202. ^ "Spanish Mission/Mediterranean, Manly City Council, 2006". manly.nsw.gov.au. Retrieved 2015-09-04. ^ "Spanish mission style - Australian Capital Territory". Sydney Morning Herald. October 31, 2007. Retrieved 2015-09-04. ^ Sharon and Sharon Springs – Sharon Historical Society – Google Books. Books.google.com. 2015. ISBN 9781467122757. Retrieved 2017-04-24. ^ Shea, Robert (1987). From No Man’s Land, To Plaza del Lago. 919 N. Michigan Ave., Chicago, IL. 60611: American References Publishing Corporation. Wikimedia Commons has media related to Spanish Colonial Revival architecture. Gauvin Alexander Bailey, Art of Colonial Latin America. London: Phaidon Press, 2005. Weitze, K. (1984). California's Mission Revival. Hennessy & Ingalls, Inc., Los Angeles, CA. ISBN 0-912158-89-1. Nolan, David, The Houses of St. Augustine. Sarasota, Pineapple Press, 1995.